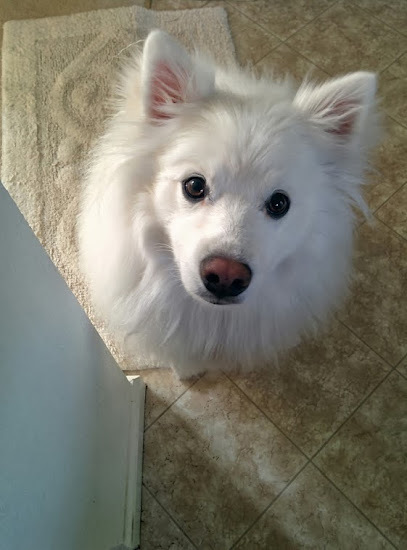 Ruckus the Eskie: Thoughtless Thursday #3: Does Your Sapien Love You More than Their Partner? I recently came across an article on Mashable that relayed the a research finding: "1 in 10 Women Loves Her Pet More Than Her Partner." After following through the link to the study, I was presented with The Brooke's report, which at first glance doesn't appear to be a strong report. Why wouldn't 1 in 10 women love me...wait why not more!? First, the article initially references a study but does not mention who conducted the survey. One in ten women claim they love their pet MORE than their partner, a study revealed yesterday. It is only after six lines do we learn who conducted the study-The Brooke itself. It’s not surprising then that a whopping 81 per cent of women said they consider their pets as part of the family, the poll by animal welfare charity the Brooke revealed. I was merely curious why a Media Release wouldn't mention the study conductor earlier. Maybe this is normal for these kinds of articles? This seems accurate. Although I think both of my sapiens love me more in these situations! Should they or shouldn't they? I'll take more un-guilty love any day! What ever just happened to 'Mom' with roses? This was a study conducted in the UK, so maybe the numbers may be a little different based on our cultural differences in the States. Someone should perform a survey! Me??? How did you feel about some of the statistics presented by The Brooke? Reminder: If you want to be notified by email the next time the Thoughtless Thursday or Sepia Saturday blog hops are open, sign up below! Hi Ruckus! and Happy Thoughtless Thursday! I think of my pack as my babies of course, but I wouldn't say I love any member of my family more then the other.....plus if my hubby caught me saying that, I don't think he would appreciate it Hahaha! Yikes! I don't think I can answer this on the grounds that....well, never mind. I love them all the same!! Very interesting survey though!! Happy Thoughtless Thursday! Of course they love their pets more. Was this in question? Silly humans. Thanks for the hop! We have no one else so the answer is YES. HAHA you two are funny. I cannot resist the thought that it's so true though. Love it! I know Mom says we are the most important beings in her life. Lucky for us to be so loved! Hey Ruckus. I don't think those numbers are surprising and I think they would be higher in the US! We love our pets - but never let them into our beds….and just my opinion - I think the "love" for a pet is different than the "Love we have for humans - maybe even a semantics problem with word choice- but woof - go pets - because they do make the world a better, richer place! Ruckus, I think you should conduct a survey and get some REAL answers to these questions! This was fascinating. Mom always asks me to jump into her lap to cuddle and watch a movie - Dad just sits in his chair so I believe this to be true. Happy Thursday! Hmmm I dont love my dogs more, but I love them second after my partner. They are my family and I am closer to them than all family and friends other then my husband. I feel no guilt about this at all. I have chosen not to have children and I feel that my pets are my family. We don't think it really matters. But then, we only have one human. Pets are part of the family and get to sleep on the bed here! Ooooooh. This is a tough one. I love my sweet Hunny best and always will,. I think it's cowardly to love your dog more than your spouse. Loving your dog isn't difficult, doesn't really require sacrifice and change. Loving your spouse does. I'm not saying for everyone, since everyone's situation is different, but mostly I think it's a selfish response. Don't get me wrong, owning a dog requires sacrifice, but loving it does not, typically. Words of wisdom there from Flea! Very true. Eeek sorry about the link, I tried to change it now but I have to admit I'm terrible at this! (For instance, how do I include the link if I plan the post the day before since I am not around in the morning to get the current link?! Sorry, you probably wish you hadn't asked me!). Interesting study! The Husband is #1, but Moses and Alma are definitely close at his heels! I heard of a study once that people would save their dogs' lives over an unknown person's when given the hypothetical (e.g. the train is coming and you can only save one). Oh that is a good study! I wonder what really would happen in a real life situation. Hopefully it will never have to come to that! I certainly wouldn't say i love Bentley more than my husband or kids but if you go further out on the family tree...BOL!! I'm sorry to say, but I really think my dad loves me more than he loves my mom. He is kissing me goodnight before he kisses my mom. And actually my mom might love me more than she loves my dad, because I get all the kisses before my dad does. So they are egual LOL. I love my pets way more, they just hold a special bond. What can I say??? What an interesting topic and survey! I am not surprised by any of the information contained within the survey. As a woman that has been happily married almost 25 years, I will not say that I love my dogs more than my husband but they are definitely better listeners! The only one that surprised me was that 19% don't consider the pet part of the family…That's one in five! Which rock are all those people hiding under?